Put differently, an open mind requires an open heart. If I love you, I will tell you the truth. That is, I’ll say what I truly believe. This takes some courage and risk, because you may show me that some of my beliefs don’t jibe with the facts. I must love you enough to take that risk, and love myself enough to eat crow. How you feel emotionally controls what you’re likely to think, what you’re likely to understand (or not), what your mind is likely to “see” or ignore. I have gone into this in depth in previous posts. Related: “Seeing red” is real. But how does it happen? We can choose how we feel. I choose whether or not to open my heart to you. Learning how to choose your feelings is what I believe Jesus was all about, and I talk about that here: The Way of Peace. What you see from the mountaintop is not what you’ll see from the valley. Conservatives and liberals “come from” different “places,” and can’t help but see things different ways. The facts that are most obvious to one side, may not even be visible to the other. Much of our strife comes from inability to agree on what the facts are — just because “we” can’t see them, doesn’t mean “your” facts don’t exist. If we listen to each other, we may come to understand. But this won’t happen as long as there’s hostility on both sides. To open one’s heart is a choice. Whether we realize it or not, we choose our feelings first, and then look for reasons or excuses to say those feelings are correct. If a person wants to hate, and there is no handy excuse in the facts as they are, he or she will make up an excuse. If Colin Kaepernick had asked me, I would have told him not to kneel for the anthem, because lots of people were sure to take it wrong. And sure enough, they did. They took him as disrespecting the flag and our veterans. And lots of people hate the NFL now because of it. Someone wanted to hate them more. 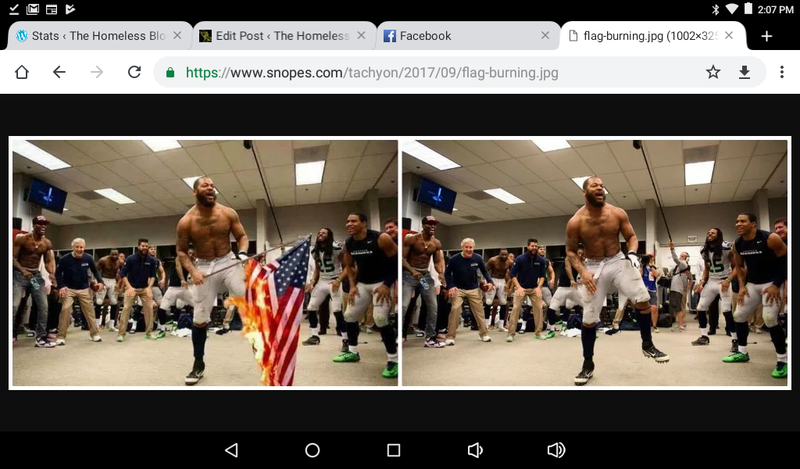 So, this person found a picture of NFL players dancing in the lockerroom, and Photoshopped a burning flag onto it. Snopes tells the whole story here. The fact is, the flag-burning never happened. The fact is, it’s a lie. Some folk don’t care too much about facts. To say this with as much love as I can: I wonder, then, how much they care about truth, and how they can get up in arms — all over their desire to live in a fairy tale world. Rejecting facts can only lead to anger and frustration forever. … open their hearts will help solve America’s problems. Those who don’t, won’t.